Milner and Lord Nathaniel Rothschild as well as Cecil Rhodes but he died in 1902. By the time the year 1900 came around the British Empire had been the number one power in the world when it came to commerce, trade and economically it was unchallenged for 200 years that was until Germany started to bite away at the profits this brought to the secret cabal\bankers in London. By the early 1900’s Germany had strong trade links worldwide and was even matching or surpassing economically the British Empire. The British Elite would not tolerate the success of Germany therefore a plot was hatched to smash Germany and break up the country so that it could never regain its economic power. This plot was well researched and covered by American scholar Professor Carroll Quigley in the books Tragedy & Hope and The Anglo-American Establishment. Quigley lectured at the top universities in America and was an advisor to the American Department of Defence. Part of this plot was also to break up the Turkish Ottoman empire in the middle east which included its control of Palestine and Iraq. To make the war possible first pacts and agreements between countries had to be put in place. So the secret elite set up the Triple Entente agreement between Britain, France and Russia in 1907. Meaning if one of them went to war the other two countries would come to their aid. These three countries have nothing in common, they don’t even speak the same language and they have constantly been at war with each other over the past few hundred years. So there is no valid reason why they should join together in an agreement unless this agreement is used to make the three countries fight a war. That is exactly what this agreement was used for. Russia had another agreement were it was allied to Serbia. Germany had an alliance with Austria-Hungary. But this was natural as Germany and Austria had the same culture and language. All that was needed next was an event to spark a confrontation between two countries in opposite agreements. The plan was to get Austria involved in a conflict which would then draw in Germany on Austria’s side. This nearly happened in 1913 when Serbia took territory from Bulgaria and then moved into Albania. Austria-Hungary then came to Albania’s aid and a war looked likely but Germany insisted with Austria-Hungary that negotiations must take place and Russia insisted Serbia withdraw its troops. War was averted this time but not the next time. The Serbian Black Hand was a secret military society that was created in 1911 and carried out atrocities against the Bulgarians in the Balkan conflict of 1913. 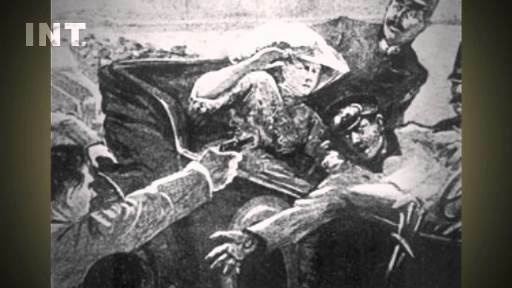 The leader of this Black Hand was Colonel Dragutin Dimitrijevic and he recruited a revolutionary group known as the Young Bosnians to assassinate Archduke Franz Ferdinand of Austria when he visited Sarajevo in June 1914. The assassins were waiting along the route that the Archduke would travel and a bomb was thrown but it hit the carriage behind the Archduke. The Archdukes carriage then ran off to the town hall but the Archduke insisted that he should go to the hospital to see the injured. Unbelievably the carriage went along the same route were the first bomb went off and it then turned down the wrong street were an assassin by the name of Gavrilo Princip was waiting and he shoots the Archduke Ferdinand in the neck and his wife Sophie in the stomach. The Archduke is still alive when witnesses arrive to give aid. His dying words to Sophie are, "Don't die darling. Live for our children." The Austro-Hungarian authorities arrested all Assassins and those who assisted them. 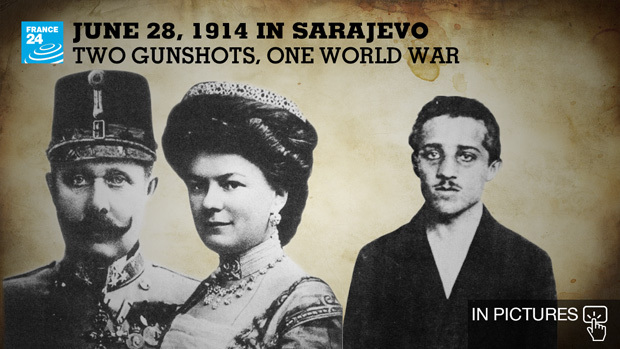 4 of them were hanged and the others such as Princip were sent to prison. He died in prison in 1918 of Tuberclosis. Serbian complicity in the assassinations was easily proved but any evidence of Russia’s involvement with this plot had to be silenced and that is why Serbia executed by firing squad the leader of the Black Hand, Colonel Dragutin Dimitrijevic in 1917. But why should 880’000 young British men die (20 million total deaths) because Serbian Revolutionaries murdered an Austrian Archduke. The world is run by psychopaths, that’s why. The Secret Elite then used this assassination to stir up the flames of war between Austria-Hungary and Serbia which ultimately led to the countries in the alliances and agreements to go to war. The ultimate aim was to get Germany involved in the war so that it could be crushed. Britain’s Sir Edward Grey had told the German ambassador that Austria-Hungary had a free hand to act according to her own judgement with regards to Serbia’s Punishment and Britain had entered into no secret alliances. This was just a deception as he knew full well that Britain would swiftly join Russia in any war against Austria-Hungary\Germany. As Serbian’s assassinated Austria’s heir to the throne ten demands were given to Serbia and these included, stopping anti-Austrian publications, dissolve the secret society Narodna Odbrana, put an end to the teaching of anti-Austrian propaganda in schools, known conspirator’s had to be placed under arrest and Austrian police had to be able to assist in the Serbian enquiry into the assassination. 48 hours were given to the Serbian government to accept these demands. Britain, France and Russia then complained that Austria-Hungary was trying to start a war even though they encouraged Austria-Hungary to take action against Serbia. Of course this as happened again since then to start the Gulf War. America gave Saddam Hussein assurances that it would not take action if Iraq attacked Kuwait to get back Iraqi oil that Kuwait had stolen. But this was just deceit and we all know what happened next. But this is the kind of tricks the secret elite play to start wars. Only 2 of Austria’s 10 demands were accepted. The Secret Elite knew that Austria would not accept this. Austria had tried for negotiations with Serbia for 4 weeks after the assassination but these were rejected. Germany did not start World War 1 and the truth is that Britain and the secret elite worked behind the scenes to make sure that Serbia did not meet the 10 demands and thus provoking a further response from Austria. On 23rd July Russia began mobilising her huge armies and on the 25th Serbia started mobilising her army and Austria then responded by doing the same hours later. But the Secret Elite had to make sure that Germany fires the first shot and is blamed for starting the war. But it was Russia and Serbia who mobilised their armies first. Austria declared war on Serbia on July 28th. On the 29th the Czar Nicholas II signed the order for the full mobilisation of the Russian army as engineered by the Secret Elite. Germany was the last country to mobilise her army for WW1 because she had to as an act of self defence against the Russians on one side and the French on the other. On the same day Chancellor Bethmann of Germany and the Kaiser both sent telegrams to Austria to ask them to try for more negotiations and at the same time the Kaiser sent a telegram to his cousin the Czar asking him to stop the mobilisation of the Russian forces or the responsibility for starting the war will be on his shoulders. But the Kaiser’s pleas were ignored. Kaiser Wilhelm and Germany were always blamed for starting World War 1 but this was just a lie that was used so that Germany and its industry could be broken up and for it to also pay huge reparations to the other nations. The British were not swayed yet by a war against Germany. I think most civilians in Britain at the time would have sided with Germany in the war and not Russia. But there opinion would be changed by hateful anti-German propaganda. The secret elite would then have to make sure that it would look like Germany was the aggressor in starting the war. They would encourage the French to attack Germany through Belgium. Germany would have to advance into Belgium to defend itself. This would then be an infringement on the sovereignty of Belgium and Britain would have to come to her aid. Do we really think that the British government cares so much about the sovereignty of any nation when the British Empire has trampled over so many countries over the past 200 years? Of course it doesn’t, Belgium was used by Britain to declare war on Germany as the Poland situation was engineered 25 years later to declare war on Germany again. The Germans even offered neutrality to Belgium if they allowed Germany to send its troops through Belgium to stop the French and they offered to give payments to Belgium for this, but unfortunately for so many young men this was refused. On August 4th Britain sent a message to Germany stating it needed reassurance’s that Belgium neutrality wold not be violated. Germany could not give this assurance as it needed to stop the French advancing through Belgium. So at 11.00 p.m. on August 4th 1914 King George V announced that a state of war exists between Great Britain and Germany. 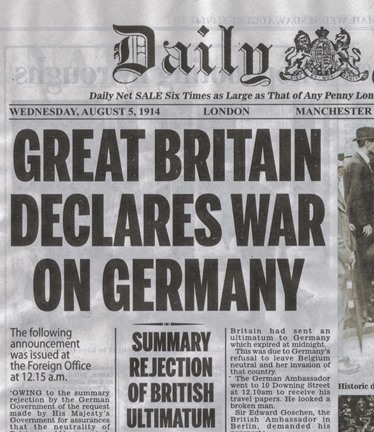 It was Britain who wanted war against Germany and that is why they declared war against them. If Germany wanted to conquer France and Britain it would of declared war against them but it never did. So 20 million human beings had to die because an Austrian prince was assassinated by a Serbian and German troops had to advance through Belgium to stop the French. I don't think so. The real reason was because the British secret elite wanted to crush Germany so that it was not an economic competitor. It had to make sure that Germany could not rise again, that's why the Versailles treaty was so brutal. Split Germany up take away its industrial resources, then it is no longer powerful and that is exactly what happened to Germany after the war. It was blamed for a war it did not start. After two years of absolute carnage and bloodshed, during mid-1916, Germany had just about won the war. The German U-boats ruled the Atlantic Ocean and Great Britain stood virtually alone with all armaments almost exhausted and a severe lack of food supplies. 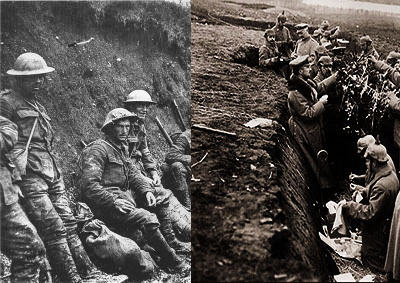 The Battle of the Somme had been a disaster for Britain having lost more than one million men, either dead or injured and the French army lost 600,000 men to mutiny in the defence of Verdun on the Somme. The Russian army was retreating and they were out of the war and returning home. Britain was ready to capitulate. In Germany’s spring offensive of they marched to within 70 miles of Paris and nearly forced the British into the English Channel It is at this moment that the famous stab in the back happens when Jewish Zionists trade union leaders in Germany order factory strikes which deprive the German troops of much needed supplies for the war. It was at this point that Germany offered peace terms. Although it was in a much stronger position than Britain and no enemy soldiers were on its territory. But then Jewish Zionists approached the British War Cabinet and offered them a deal. The deal was that at the end of the war Britain had to promise to give Palestine to the Jewish people so that it could have its own state. At the time Palestine was controlled by the Turkish Ottoman Empire which was allied to Germany. There end of the bargain was that the Jewish Zionists and bankers (Rothschild) would persuade America to enter the war on the side of Britain. This was known as the Balfour declaration and was written to the Jewish Zionist Banker Lord Rothschild. To anyone who says this is a conspiracy theory then listen to the words of Chaim Weizmann who served as secretary of the World Zionist Organization and later as the first president of Israel “The only way (which proved so to be) to induce the American President to come into the war was to secure the cooperation of Zionist Jews by promising them Palestine, and thus enlist and mobilize the hitherto unsuspectedly powerful forces of Zionist Jews in America and elsewhere in favour of the Allies on aquid pro quo contract basis”. Britain accepted the deal and within 6 months America entered the war. Benjamin H. Freedman was one of the most intriguing and amazing individuals of the 20th century. Born in 1890, he was a successful Jewish businessman of New York City at one time principal owner of the Woodbury Soap Company. He broke with organized Jewry after the Judeo-Communist victory of 1945, and spent the remainder of his life and the great preponderance of his considerable fortune, at least 2.5 million dollars, exposing the Jewish tyranny which has enveloped the United States. Mr. Freedman knew what he was talking about because he had been an insider at the highest levels of Jewish organizations and Jewish machinations to gain power over our nation. Mr. Freedman was personally acquainted with Bernard Baruch, Samuel Untermyer, Woodrow Wilson, Franklin Roosevelt, Joseph Kennedy, John F. Kennedy, and many more movers and shakers of our times. The Willard Hotel, Washington, D.C., speech (below) was given before a patriotic, Christian audience (NOT before Nazis as some have suggested) in 1961 on behalf of Conde McGinley's patriotic newspaper of that time, Common Sense. Though in some minor ways this wide-ranging and extemporaneous speech has become dated, Mr. Freedman's essential message to us -- his warning to the West -- is more urgent than ever before. So the Jews got America into the war which was the reason that Germany was defeated. This is just one of the reasons why Hitler and many Germans disliked the Jews and who can really blame them for that after what they brought down on to Germany. Also the might of Britain, France and Russia would never have defeated the Germans by themselves. American people were pro-German and had no axe to grind against Germany and had no reason to go to war against them. But the people were brought around to disliking the Germans through propaganda in the Jewish press and the planned sinking of the Lusitania. 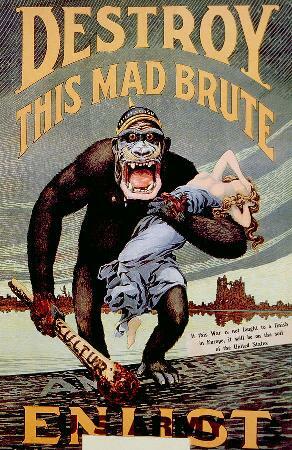 Below posters that Britain and America used to turn the people against Germany. 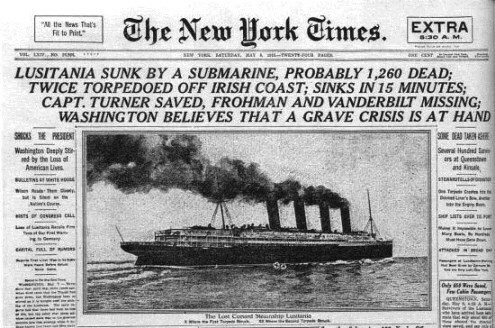 The Lusitania was sunk by a German U-Boat on May 7th 1915, 11 miles of the coast of Ireland with the loss of 1198 lives, 128 of which were American citizens. The German Embassy had placed adverts in newspapers in America warning not to travel on the ship. The ship also had munitions inside it to help Britain’s war effort and the Germans will have known this. The Lusitania would have had two warships sailing beside it for protection but these were suspiciously called off by Lord of the Admiralty Winston Churchill. Also Germany declared all seas around Britain as a war zone. Under these circumstances was it wise to send this ship to the U.K unprotected. It was sent in the hope that it would be sunk so as to turn public opinion in America against Germany. Had America not joined the war it would have ended in a stalemate or truce. As it happened the Jewish Zionists cost the lives of 117,000 American soldiers and 200,000 injured, not to mention the other nation’s soldiers who died after America joined the carnage. However by the autumn of 1918 it was clear that Germany could not win the war but you could say it could not lose it either. No enemy soldier had set foot in Germany and Berlin was 600 miles away from the safety of the front. 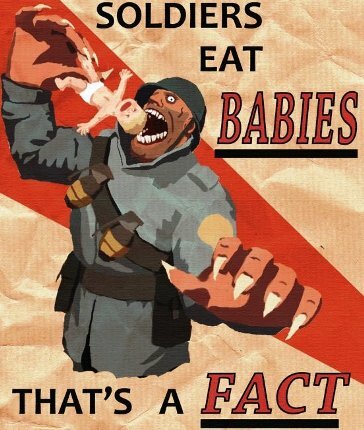 Russia was not in the war anymore so the eastern front was safe. Kaiser Wilhelm offered negotiated peace terms based on Woodrow Wilson’s 14 points and at 5 A.M. on the morning of November 11, 1918 an armistice between Germany and the Allies was signed in a railway car parked in Compiegne near a French forest. Vast areas of northern France were reduced to rubble and hundreds of thousands of French homes destroyed. The cities Flanders and Ypres in Belgium were all but destroyed. Allegedly Britain came into the war to protect Belgium’s sovereignty, what nonsense. Let us look at the casualties. The number of soldier killed on all sides totalled 9.7 million with 21 million wounded. Nearly 7 million civilians on all sides died. Britain’s blockade of Germany which lasted until 8 months after the war had ended cost the lives of about 2 million German civilians, mostly women and children. Another atrocity led by Winston Churchill. Unbelievably Germany was to be blamed for starting the war and blamed for all the death and destruction and would have to pay all the victorious nations money to cover their costs. Britain’s starvation blockade was set up until Germany signed a document accepting responsibility for the war. 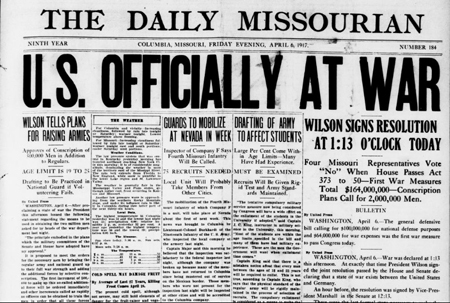 The American President Woodrow Wilson set 14 points as the terms for a peace treaty to end the war. Germany agreed to the armistice on good faith that these 14 points would be carried out. But once the Paris Peace Conference was set up in 1919 France and Britain would ignore these 14 points and instead they came up with the barbarous Versailles Peace Treaty which was set up to financially and economically crush Germany so that it could never rise again. This was the secret elite’s objective from the beginning. These were the main points of the terrible Versailles Treaty. 2. German armed forces restricted to 100,000 men. 3. The industrial German Rhineland will be occupied by French troops for 15 years. isolated from the rest of Germany! 6. The German Sudetenland (3 million Germans) region is put under the rule of the new nation of ‘Czechoslovakia’. 7. The new state of Austria is forbidden from uniting with their brethren in Germany. 8. Germany is stripped of African colonies, Cameroon, Namibia and Tanzania. Britain, France, & Belgium take them. 9. The coal-rich Saar region of Germany is placed under League of Nations control for 15 years. During this time, its coal is to be shipped to France. 11. Germany is forced to pay massive war reparations in the form of money and natural resources. German economy and soon cause a hyperinflationary monetary collapse. No country in the history of the world that has ever lost a war has had such nefarious conditions placed upon it. Any serious historian knows that if Germany won the war they would not have placed the same conditions and reparations on Britain. Do you really think Germany would have took all overseas territories of Britain, Stolen her coal mining, removed her navy and air force and took away Scotland and Wales. No I am sure that would not have happened but Britain was prepared to do this to Germany and that was the plan from the very beginning. A million Germans, mainly women, children and old people, starved to death as the result of the Royal Navy’s food blockade. This blockade was kept for 8 months after the war until Germany signed the treaty and accepted all these conditions. This treaty was the only reason that World War 2 broke out. Before World War 1 broke out Germany was the most powerful country in Europe. Germany did not start the war and gained nothing from it except loss of its territories and land, loss of its navy and air force, loss of its industries and bankruptcy. Germany had to pay huge reparations to Britain and France but it could not do so because its shipping and coal mining had been taken away from it. Britain, France and the Jews were the only ones who gained anything after the war. Britain and France gained Germany’s overseas territories and received its coal production plus they received money from Germany and their main economic competitor in Europe was gone. The Jewish bankers bankrolled both sides in the war and gained huge profits and the Jews had the promise of taking over Palestine. The Turkish Ottoman Empire was broken up and Britain took charge of Palestine which they later handed to the Jews. Another thing to mention here was that the Jews had a huge representation at the Paris Peace Conference. The following leading Jews were there to advise America, Britain and France :Lord Walter Rothschild, Lionel de Rothschild, Sir Phillip Sassoon, Moses Montefiore, Felix Frankfurter Jacob de Haas Paul Warburg Bernard Baruch Jeroboam Rothschild and many more. But you might say why should the Jews be there at all, they were not the leaders of any country. The Jews normally get Christian soldiers to fight there wars and then reap the benefits. It just goes to show you the power the Jews had on the presidents and prime ministers and I would suggest they had a huge say in laying down some of the Versailles treaties main terms which were to crush Germany. Yet it is still a great puzzle to some people why some Germans disliked the Jews, I don’t understand why that might be. To sum up the Secret Elite in London and its Allies wanted to crush Germany and reduce its size and economy and this is exactly what happened. They brought this about by falsely blaming Germany for starting the war and for all the death and destruction, which was just nonsense and lies. The Jews also had a hand in Germany’s downfall with their action in getting America into the war. They must have known that Germany could not accept or live under these conditions forever. Any country with any self-respect would try their hardest to remove these restrictions placed upon them. Who knows maybe some man or organisation will come along and remove the Versailles treaty that is strangling the German people. On a slight side note a certain soldier came out of the war that would end up being that man. 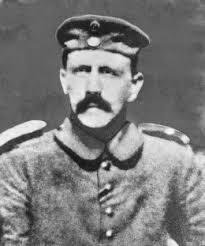 Adolf Hitler was 25 when he volunteered to fight for Austria in World War 1. He served with great distinction, and was promoted to Lance Corporal after being awarded the German Iron Cross 2nd Class for bravery. In 1916 he was badly wounded and was sent to a military hospital. He could of went home but volunteered to go back and return to the front line. In 1918 he was awarded the Iron Cross 1st Class and later was temporarily blinded by a British poison gas attack.